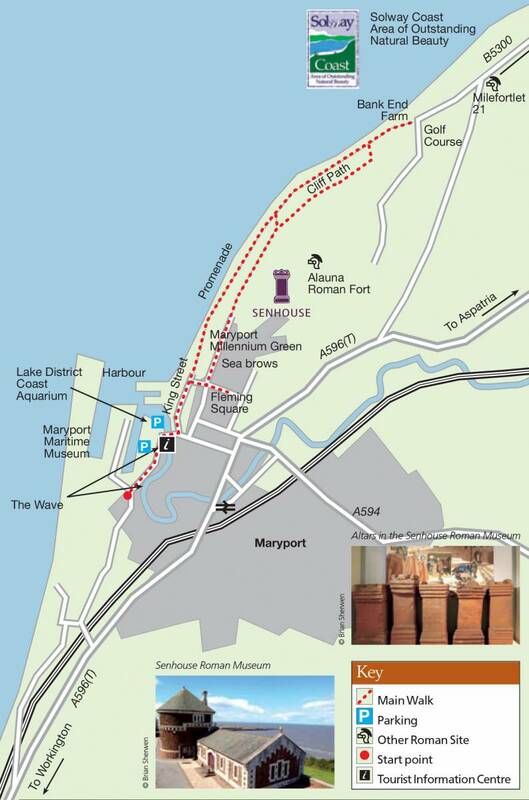 Maritime Maryport on the edge of the Solway Coast Area of Outstanding Natural Beauty. From the Maritime Museum, cross the road and head down King Street. Turn right at the junction. Walk up the 109 steps, turn left at the top and walk up the grass path. Turn left to the sea brows and walk north away from the harbour, to reach Senhouse Roman Museum. Follow the hard surface path as it meanders down the sea brows. Eventually this easy-going cliff path forks. To the left, you can take a short cut back to Maryport along the promenade. If you bear right you will continue on your way over the second of three hills leading towards Bank End. Now turn back and begin your stroll along the long, dog-legged promenade to Maryport. Turn left off the promenade opposite the play area and continue along the road past the Maryport Millennium Green. Follow King Street until you arrive back at the harbour. Journey planner enquiry line Tel: 01228 606000 Stagecoach Cumberland Tel: 01946 63222. Maryport railway station is a stop on the scenic Cumbrian Coast Line.